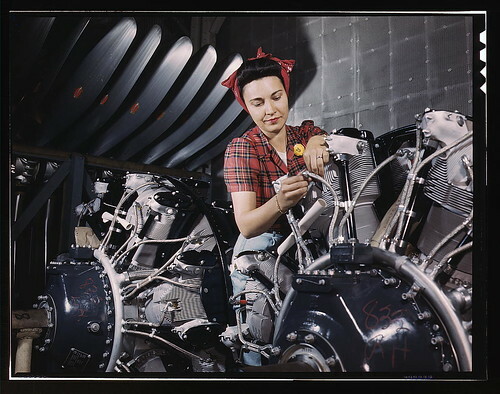 Woman working on an airplane motor at North American Aviation, Inc., plant in California. From the Library of Congress collection in the Flickr Commons. Click image to view source. The curious abbreviation NaBloPoMo refers to National Blog Posting Month, which began a couple of years ago as a call for bloggers to post something every day for a month. (It's a spinoff of National Novel Writing Month.) Thanks to the efforts of people like Eden, NaBloPoMo is now celebrated every month of the year. There is a theme suggestion for each month, but blogging on the theme is always optional. It lives on as an exercise in developing the habit of regular blog posting. I jumped on board NaBloPoMo for the month of July. It was a good time for me, as I had finished up work for my current solo show (Back to Normal at the Gaylord-Pickens Museum, through September 19). I always have more ideas than I have time to write about (or paint about), so I had a stack of blog topics saved up. I diligently released one post a day for three weeks. Then I stopped. During those three weeks, I noticed my blogging behavior adapt like a small fish put into a bigger pond. The more blogging I did, the more topics I found worthy of blogging about. I could do it all day, every day. It was a rewarding experience, though limiting in other ways (my time, a valuable resource, was depleted). Around the fourth week of July, daily blogging lost its importance for me. I had three shows open, my car had been totaled, etc etc; my blog slipped down my list of priorities. My readership had increased during daily posting (mostly via Facebook), but not dramatically. So I let myself off the hook. I'll continue blogging, of course, but I don't plan to hold myself to a stringent timetable. Quality, not quantity. It's time for me to focus on being a painter, especially now that I have a new studio. Stay tuned. Thank you, folks out in internetland, for reading this.